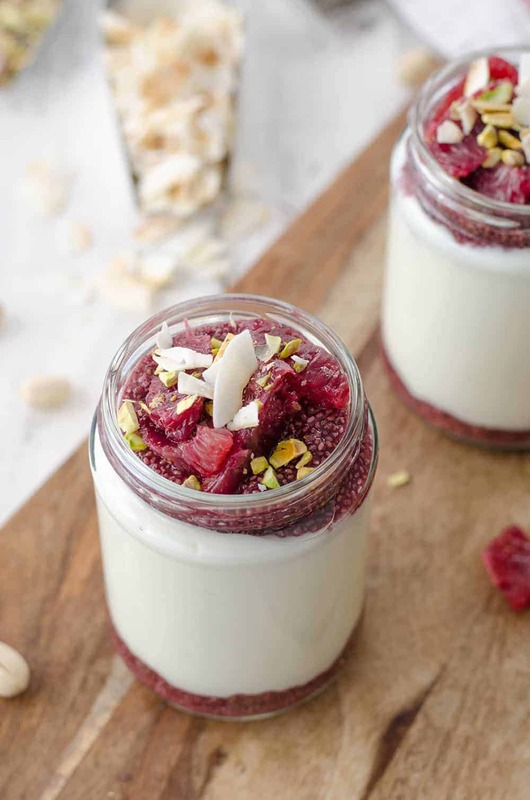 Overnight Blood Orange Chia Pudding Parfaits! Make these ahead of time for an on-the-go, nutrient-packed breakfast. Layers of blood orange chia jelly with vanilla yogurt. Valentine’s may be over, but I’m still loving all things PINK. After scooping up a large bag of juicy blood oranges a few weeks ago, I’ve been putting them into everything from smoothies to salads and now, chia seed pudding. Ever since I realized that chia seeds + liquid = natural jello, I fell hard for the simple, nutrient-packed combo. Always be gellin. Honestly, that may be my new kitchen motto, especially when made with fresh-squeezed blood orange juice. That color! It’s the perfect contrast to the gray and dreary mornings that have been present for almost the entire month of February. With each bite of these beautiful parfaits, I’m daydreaming of poolside days and warm evening nights. It’s pretend spa food for my tiny, frigid kitchen. The best part about these parfaits? Make them ahead! Yup, just like everyone’s favorite oatmeal, these chia seed pudding parfaits are getting the overnight treatment. For this month’s Recipe Redux theme “Break out of Breakfast Boredom”, I’m swapping out my overnight oats for these overnight parfaits. Squeeze the juice, stir in chia seeds and let gel. 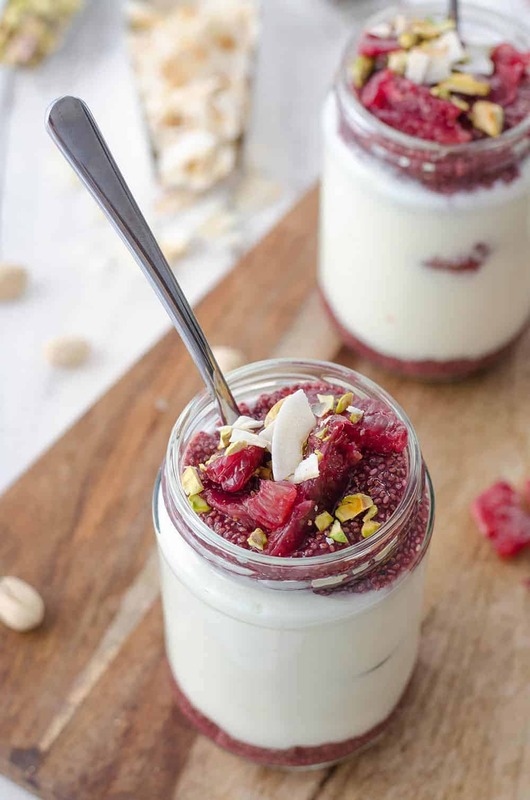 Then, layer blood orange chia pudding with your favorite yogurt and top with chopped pistachios and toasted coconut for an extra layer of crunchy texture. It’s like granola, minus any added sugar. If you love fruit on the bottom yogurt cups (but hate the endless grams of added sugar/fake fruit), then these parfaits are for you! Any container will work for this breakfast, though I think they look best layered in a tall glass. I always have a few mason or old jelly jars lying around, which are perfect for layering and then placing in the fridge for breakfast all week. To make sure it would work, I assembled all of these on Sunday and ate one every day of the week. (I know friends, the things I force myself to do in the name of food blogging.) By Friday, while some of the yogurt and chia jelly had bled together, it still tasted great! You deserve a spa breakfast. Blood orange chia parfaits > months old granola bar in your desk. 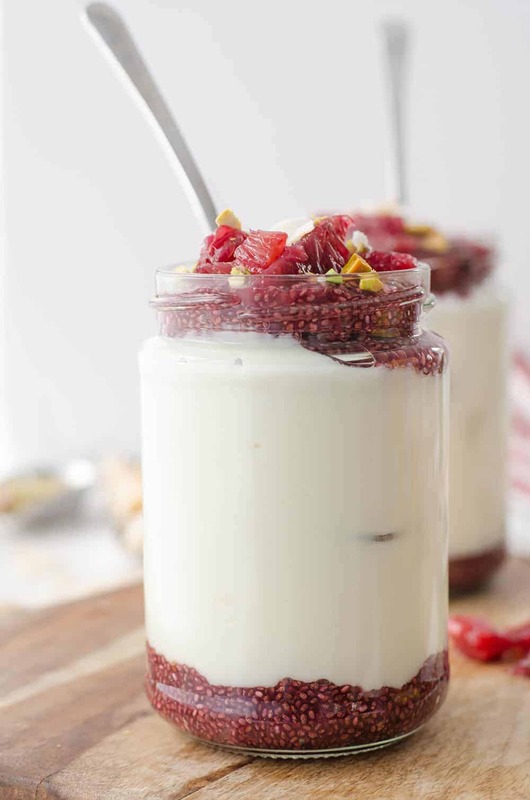 Blood Orange Chia Pudding Parfaits! Make ahead breakfasts! Layers of blood orange chia jelly with vanilla yogurt. Make them before for an easy grab and go breakfast option! Whisk together the juice, chia seeds and maple syrup and place in the fridge to let gel. It should take 2-4 hours to come together. 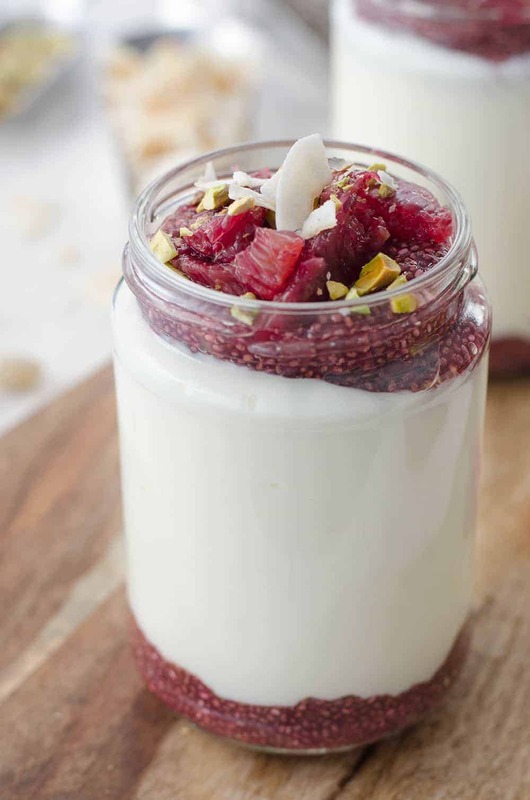 Divide mixture among 4 resealable jars, layer 2 tablespoons blood orange chia jelly, 1 cup yogurt and 2 tablespoons chia jelly. Top with garnishes of choice. Cover and place in the fridge to enjoy! O blood oranges, so so good! 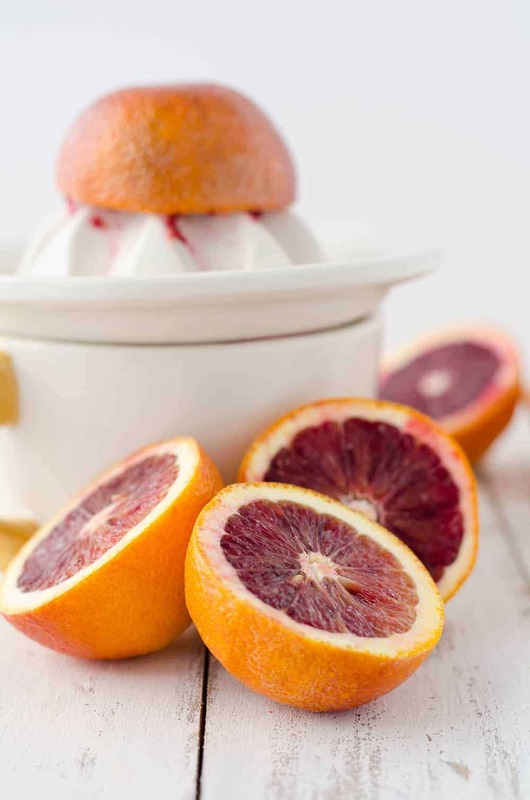 I have been loving on some blood oranges lately! I could totally put this chia mixture on everything, especially oatmeal and some avocado toast! Blood orange makes this so delicious and beautiful! Such beautiful photos – I saw this on instagram too; I must make it! I think we were on the same wavelength for this month’s redux. Oranges, coconut, and pistachios. Such a great combination. I too love chia puddings, and I’ll definitely be making this. I can’t believe I haven’t eaten any blood oranges yet this season, what is my deal?! These are absolutely gorgeous, can’t get over that color. How gorgeous and vibrant are these?! Love blood oranges & chia pudding, so will be making this. Perfect breakfast for busy weekdays, esp because they can be made ahead!